Is Reid saying that Jordan and Egypt are Israeli settlements, those “amorphous things”? Or that Gaza City and Tel Aviv are Israeli settlements? How about Jerusalem? Perhaps the entire country of Israel? Are vast parts of Egypt and Jordan “taken up” by Israeli settlements? Reid’s producers pulled the map from an Atlantic article by Wajahat Ali (“A Muslim Among Israeli Settlers“), who appears as one of the panelists on the broadcast. The Atlantic does not misidentify the map as representing Israeli settlements in the West Bank. CAMERA has contacted MSNBC to request correction. 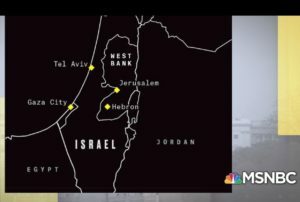 This would not be the first time that MSNBC was compelled to broadcast an apology for the gross misuse of maps of the region. Please notice that on the air Joy pointedly says “this is not the one (map) that shows all the settlements. “ She then says this would be seven for my producers. 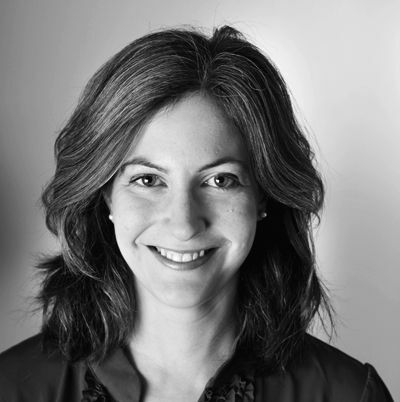 She is not referring to seven settlements—she is alerting the producers in the control room that she wants to use the seventh element from the numbered list of graphics and video that she refers to while discussing a particular topic. Once she realized that the map she was seeking was not the one that was shown she immediately mentioned it on the air. Her mention of the number seven was not a reference to the number of settlements but an on air signal to her producers in the control room to put up a different graphic. The correct graphic never did appear in the broadcast, and MSNBC declined to clarify in a future broadcast.